[18:06:54] Database: Last world database update doesn't match the required one which is 2017-01-11_01_ai_agents. [18:06:54] Database: You need to apply the world update queries that are newer than 2016-08-12_01_pet_level_abilities. Exiting. 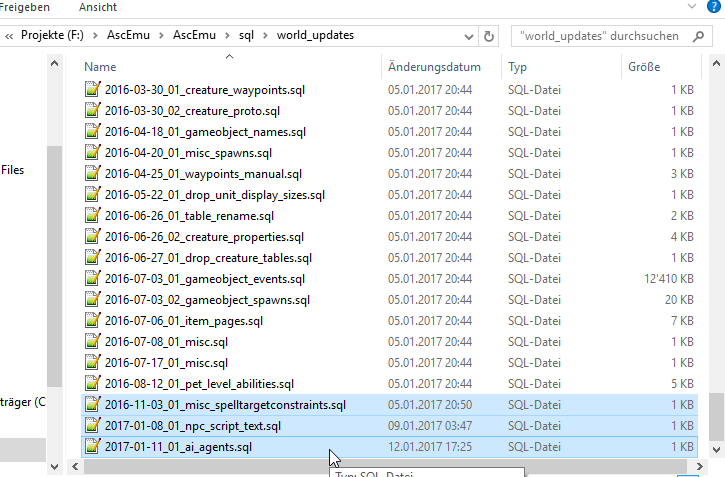 [18:06:54] Database: You can find the world update queries in the sql/world_updates sub-directory of your Arcemu source directory. ich habe die updates eingespielt hatte aber auch nichts gebracht. da steht doch dass du alle neueren updates einspielen sollst (alle die neuer als 2016-08-12_01_pet_abilities.sql).